1. In a large bowl, cream butter and sugar until light and fluffy. Beat in egg and vanilla. Combine the flour, coconut, baking powder and salt; gradually add to the creamed mixture and mix well. 2. Shape into 1 inch balls. Place 1 1/2 inch apart on ungreased baking sheets (use parchment paper for easy removal and clean-up); flatten with a glass dipped in flour. 3. Bake at 350 degrees for 10-12 minutes or until edges begin to brown. Cook on wire racks. 4. In a small bowl, beat the butter, powdered sugar, milk and vanilla until smooth. 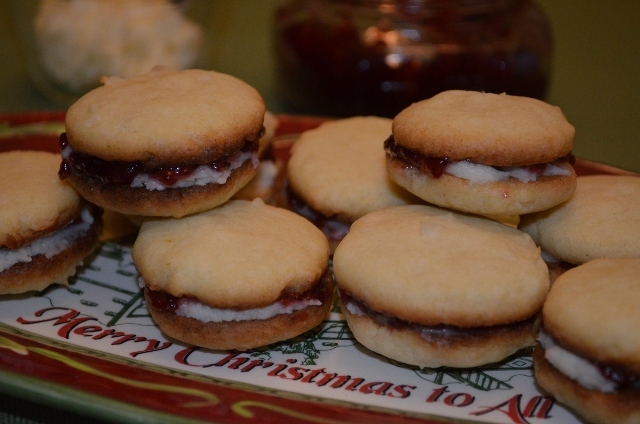 Place 1/2 teaspoon preserves and a scant teaspoon of filling on the bottom of half of the cookies; top with remaining cookies. Yield 1 1/2 dozen. I’m such a fan of raspberries! Me too. I did not grow up with raspberries as it was too hot in south Arkansas. I did not have raspberries until I got married to someone from New York state. My mother-in-law had a patch of raspberries and I quickly came to love them.